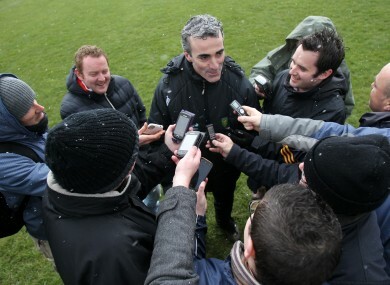 Donegal manager Jim McGuinness talks to the press after the match with Kerry last week. This was right up the street of several TheScore.ie writers. Gary Neville sits down with his old mucker Ryan Giggs for the Daily Mail. No mention of one I Thomas though. The Guardian’s Sean Ingle on another man who’s refusing to bow to Father time, Bernard Hopkins. Reading the muddled Google translate of this Andy Mitten article about the former Ireland skipper is very much worth the hassle. This one’s pretty relevant this week. Jonathan Wilson asks: is the away-goals rule counter-productive? That wouldn’t happen these digital days. Jonathan Stevenson on football in the age of the second screen is worth a read. Thanks to Aidan (@onthenickel) for pointing us in the direction of this piece by Jason Gay on Taylor Phinney’s solo ride in the Tirreno-Adriatico. Check out that 27 % climb. Email “The Sunday Papers: Keane on Cascarino, the away goals rule and B-Hop – here’s some of the week’s best sportswriting”. Feedback on “The Sunday Papers: Keane on Cascarino, the away goals rule and B-Hop – here’s some of the week’s best sportswriting”.